Silver nanoparticles (SNPs) play important role in the field of optics and electronics and also as a novel antibacterial agents. Here, we report a simple and green method for the biosynthesis of SNPs using aqueous leaf extract of Origanum majorana and Citrus sinensis as a novel bio source of cost-effective, non-hazardous reducing, and stabilizing agents. A 3 mM solution of silver nitrate was prepared. Five milliliter aqueous leaf extract was slowly added to 20 ml silver salt solution (3 mM) with constant stirring. No noticeable color change was observed. The solution was then heated in domestic microwave for variable time intervals. The intense brown colored solution was obtained on 1 min heating with O. majorana and 5 min heating with C. sinensis extract. The intense brown color indicated the formation of SNPs. The antibacterial activity of synthesized SNPs was investigated. SNPs were rapidly synthesized using aqueous leaf extract of O. majorana and C. sinensis on microwave irradiation. Formation of SNPs was confirmed by the change in color from yellowish green to brown and absorption maximum around ~420 and 410 nm due to surface plasmon resonance of SNPs. They were also characterized by other physical–chemical techniques like Fourier transform infrared spectroscopy (FT-IR), scanning electron microscope coupled with X-ray energy dispersive spectroscopy, and high-resolution transmission electron microscopy. 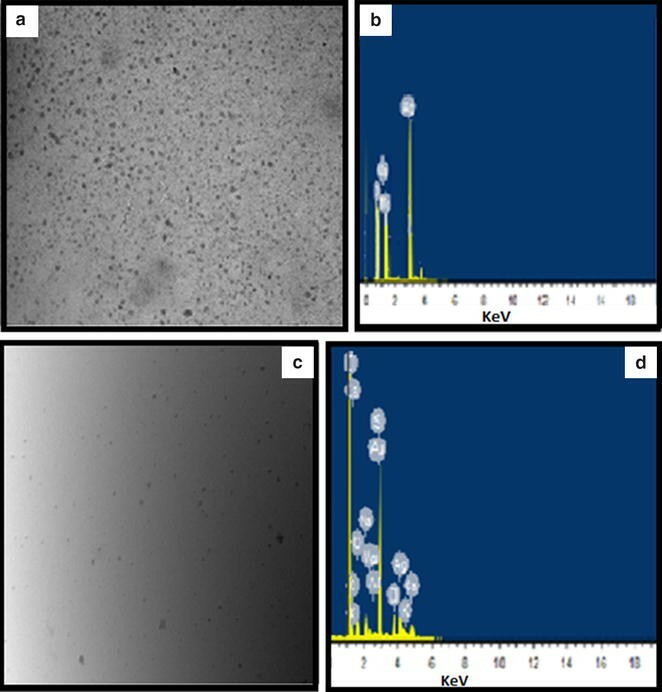 TEM analysis showed the presence of feather-shaped NPs in O. majorana and spherical as well as cubical-shaped NPs in C. sinensis-mediated SNPs. The synthesized SNPs showed significance antibacterial activity against two human pathogenic strains. The SNPs were synthesized using leaf extract of plants. This synthesis method is nontoxic, eco-friendly, and a low-cost technology for the large-scale production. The SNPs can be used as a new generation of antibacterial agents. The field of nanotechnology is one of the most dynamic areas of research because of their unique physicochemical characteristics such as catalytic activity, optical, electronic, and magnetic properties (Krolikowska et al. 2003; Catauro et al. 2004; Crabtree et al. 2003; Sharma et al. 2009). Silver has been employed extensively for various biomedical purposes since ancient time. The interest in silver nanoparticles (SNPs) has gained prominence owing to its excellent plasmonic activity, electromagnetic, optical and catalytic properties, and bacteriostatic and bactericidal effects along with antiproliferative effects compared with other metal nanoparticles. Its wide application in dentistry, clothing, catalysis, mirrors, optics, photography, electronics, and in the food packaging industry has tremendously increased its market value (Navaladian et al. 2007; Starowicz et al. 2006; Easu et al. 2010; Raveendran et al. 2003). The large surface area of SNPs allows them to interact better with microorganisms and, thus, impart good antibacterial activity even at lower concentrations. When SNPs enter inside a pathogen, the particle releases silver ions, thereby killing it. Several mechanisms have been suggested to explain the activity of SNPs on bacteria such as: (a) inactivation of respiratory chain, (b) disruption of cell membrane and leakage of its cellular contents, (c) binding to functional group of proteins causing protein denaturation and cell death, (d) blocking of DNA replication, and (e) denaturation of enzymes which transport nutrients across bacterial cell membrane (Kumar et al. 2004). The synthesis of nanoscaled silver is dominated by physical and chemical processes that include thermal evaporation, chemical vapor deposition, pulsed laser deposition, sol–gel, sonochemical, hydrothermal, etc. (Raveendran et al. 2003; Sanghi et al. 2009; Xin et al. 2010; Huang et al. 2008; Liu and Lin 2004; Vorobyova et al. 1999; Bae et al. 2002; Mandal et al. 2000; Basavaraja et al. 2008; Kowshik et al. 2003). All these methods require high energy and involve the use of toxic chemicals. To mitigate these, problems greener approaches are being explored by various scientists. One such promising method is the biosynthesis of nanoparticles using plant-based extracts (Keki et al. 2000; Jha and Prasad 2010; Yu 2007). In fact, biosynthesis approach has been considered the most effective in the synthesis of metal nanoparticles. Microwave irradiation (MWI) is considered to be highly effective technology and is widely used in the synthesis of nanoparticles because of more homogeneous heating process and can speed up the reaction rate by orders of magnitude compared with conventional heating (Bahadur et al. 2011; Jiang et al. 2013). Microwave synthesis has been increasingly applied in various fields of chemistry and materials science (Singh et al. 2012; Tanan and Saengsuwan 2014) due to its generally simple, rapid volumetric heating, and the consequent dramatic increase in reaction rate. While significant work has been reported on the use of several plant-based extracts to prepare various metal nanoparticles (He et al. 2007; Sivakumar et al. 2012; Song and Kim 2009; Geethalakshmi and Sarada 2010), but there is no report in the literature for microwave-assisted biosynthesis of SNPs from “Origanum majorana” and Citrus sinensis leaf (Fig. 1). In this article, we report a simple, robust, and eco-friendly method for the biosynthesis of SNPs using an aqueous leaf extract of “O. majorana” and “C. sinensis” as a bio-reductant and stabilizer. O. majorana is also called sweet marjoram. This plant is native to North Africa, Turkey, and SW Asia, extensively cultivated in India. Dried marjoram is extremely useful in industrial food processing and is used, together with thyme, in spice mixtures for the production of sausages. It is commonly called marwa in Hindi language. Its leaf contains protein, terpineol, sabinene hydrate (cis and trans) linalool oil, and pentosans. C. sinensis commonly called orange has high levels of glucose and ascorbic acid (vitamin C). Besides this, it also contains aldehyde such as n-octanal, 2,6-dimethyl-2,6-octadiene-1,8-dial, 4-isopropenyl-1-methyl-1,2-cyclohexanedial and alcohols like 1-octanol, β-linalool, and 1-nonanol. Further these biologically synthesized SNPs were found highly toxic against different pathogenic bacteria. Silver nitrate (AgNO3, 99.995 %) was purchased from Merck, India. NaCl, NaOH, yeast, and Tryptone were purchased from Spectrochem, India. All the reagents were of analytical grade. The O. majorana and C. sinensis leaf were collected from botanical garden of Daulat Ram College, University of Delhi, India. These were washed with deionized water before use. All glassware was washed and rinsed with deionized water, followed by subsequent drying. The collected leaf were washed several times with deionized water to remove the dust particles and then sun-dried to remove the residual moisture. The dried leaf were cut into small pieces and boiled in 100 ml deionized water for 10–15 min. After boiling, the color of the aqueous solution changed from colorless to yellowish green color. The aqueous leaf extract was separated by filtration with in Whatman No. 1 filter paper and then centrifuged at 1200 rpm for 5 min to remove heavy biomaterials. The prepared leaf extract was stored at room temperature to be used for biosynthesis of SNPs from silver nitrate. Silver nitrate solution of known strength (3 mM) was prepared in 100 ml deionized water. 5 ml aqueous extract of leaf was slowly added to 20 ml silver salt solution (3 mM) with constant stirring. No noticeable color change was observed. The solution was then heated in domestic microwave for 30 s, and there was a slight change in color of the solution. The intense brown colored solution was obtained on 1 min heating with O. majorana and 5 min heating with C. sinensis extract. The intense brown color indicated the formation of SNPs (Fig. 2). The bioreduction of Ag+ ion in aqueous solution was monitored with the help of UV-2600 series Shimadzu spectrophotometer. Fourier transform infrared (FT-IR) spectra for plant leaf powder and SNPs were obtained in the range 4000–400 cm−1 with a Shimadzu FT-IR spectrophotometer using KBr pellet method. Scanning electron microscopy (SEM) analysis coupled with energy dispersive spectroscopy (EDAX) of synthesized SNPs was done using a model-JEOL-5800-LV 16. All TEM images were obtained using a JEOL model 1200 EX instrument with an accelerating voltage of 120 kV. 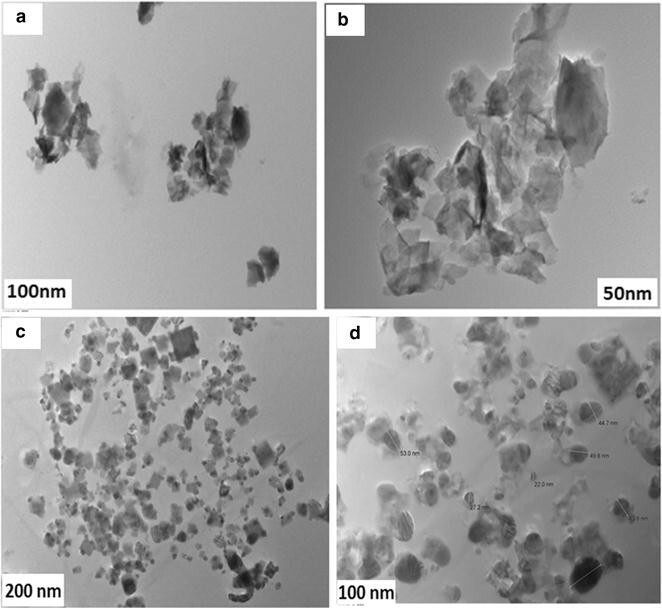 TEM samples were prepared by drop casting of nanoparticles dispersion onto carbon-coated copper TEM grid, followed by air drying at ambient conditions. TEM samples were stored in a desiccator and imaged shortly after collection. The antibacterial activity of SNPs was carried out on human pathogenic Escherichia coli and Bacillus subtilis by standard disk diffusion method. LB broth/agar medium was used to cultivate bacteria. Fresh overnight inoculum (100 μl) of each culture was spread on to LB agar plates. Sterile paper disks of 5 mm diameter containing various concentrations (µg/ml) of SNPs were placed in each plate. Each plate also contained a disk loaded with standard antibiotic as a reference. The plates containing bacteria and SNPs were incubated at 37 °C. The plates were then examined for zones of inhibition. The clear area around the disk is known as zone of inhibition. The diameters of such zones were measured using meter ruler and expressed in millimeter. The formation of SNPs was analyzed by UV–Visible spectroscopy. Figure 3(a and b) shows the UV–Visible spectra recorded from mixture of aqueous leaf extract (O. majorana and C. sinensis) and Ag salt solution as a function of time of reaction. After microwave heating, the color of the solution changed from colorless to brown. It is well-known that SNPs exhibit dark brown colors, depending on the intensity and the size of nanoparticles; the colors arise due to the excitation of surface plasmon resonance (SPR) of the SNPs (Mulvaney 1996). The SPR of SNPs was observed at 380 and 420 nm in O. majorana-mediated SNPs which steadily increased in intensity as a function of time of reaction i.e., after 30 s and 1 min. No further change in the intensity of SPR was observed when the solution was microwaved for 2 and more. This shows that the formation of SNP was completed after 1 min in case of O. majorana. Whereas SPR for SNPs formed from C. sinensis was obtained at 340 and 410 nm after 5 min. As we can see that when the mixture of silver salt and C. sinensis extract was microwaved for 10, 15, 20 min, and so on, no further increase in SPR was observed. The peak characteristic of SNPs was decreased after heating for 1 h which shows the instability of SNPs. FT-IR spectrum was recorded to find out the functional groups responsible for reduction and stabilization of NPs. The formation of SNPs was confirmed by changes in the bands after synthesis. In Fig. 4a, a broad band around 3368 cm−1 showed the presence of –OH group. Compared to plant extract, this peak showed a shift to lower frequency and a decrease in intensity on binding with the silver. Sharp band was observed at 1654 cm−1 due to the carbonyl group (Shiv Shankar et al. 2003). Peak at 1607 cm−1 showed the presence of amide I vibrations, and this band was shifted in SNPs because of the proteins that possibly bind to SNPs through the amine groups. The peaks at 2844 and 2923 cm−1 represented the symmetric and asymmetric stretching for C–H (Nune et al. 2009). In Fig. 4b, broad and intensified peak at 3421.92 cm−1 indicated the O–H group stretching of phenolic group present in the orange leaf extract. Sharp peaks at 1642 and 1598 cm−1 were due to C = C stretching, this group must be present in flavonoids and monoterpenes (Awad et al. 2014) and amide group in proteins. Peak at 1085 and 1047.57 cm−1 indicated C–O stretching in primary and secondary alcohols, respectively (Khalil 2014). Figure 5 shows the SEM and EDAX images of the O. majorana and C. sinensis-mediated SNPs. The SEM analysis confirmed the presence of nano-size metal particles. They were spherical and cubical in shape and the diameter of the particle was less than 70 nm. The SEM image of both types of SNPs showed the presence of polydispersed SNPs. The presence of optical peak at 3 keV in EDAX characteristics to metallic silver further confirmed the synthesis of SNPs due to SPR (Kalimuthu et al. 2008). Figure 6 shows the TEM images of synthesized SNPs. TEM micrographs of O. majorana-mediated SNPs clearly showed the presence of feather-like shape of nanoparticles. The average diameter of SNPs was found to be in the range of 40–70 nm. The TEM micrographs of C. sinensis-mediated SNPs showed that they were non-uniform in shape, mostly spherical and some were cubical. Particle sizes varying from 22 to 60 nm can be observed from these images. Antibacterial activity of synthesized SNPs was carried out against two bacterial strains namely E. coli and B. subtilis by disk diffusion method. SNPs showed remarkable activity against all the mentioned pathogenic bacteria. The minimum inhibitory concentration (MIC) values from Table 1 indicates that considerably low amount of SNPs (25–50 μg/ml) was able to kill the bacterial cells. O. majorana-mediated SNPs showed better result against E. coli at the minimum concentration of 25 µg/ml, whereas -mediated SNPs were good against B. subtilis. The antibacterial activity of SNPs depends upon the concentration of NPs used. As evident from table, inhibition against bacteria increased with increasing the concentration of SNPs. The nanoparticles bind to the cell membrane and also pierced inside the bacteria. SNPs interact with sulfur present in the proteins as well as with the phosphorus containing compounds like DNA (Morones et al. 2005). When SNPs enter the bacterial cell, it forms a low molecular weight region in the center of the bacteria to which the bacteria conglomerates thus, protecting the DNA from the silver ions. The nanoparticles preferably attack the respiratory chain, cell division finally leading to cell death. The nanoparticles release silver ions in the bacterial cells, which enhance their bactericidal activity (Lok 2006). The present article reports the biosynthesis of SNPs from O. majorana and C. sinensis leaf for the first time. O. majorana/C. sinensis leaf extract is capable of reduction and stabilization of SNPs. Moreover, microwave radiation and its mode of heating make the synthesis of the metallic nanoparticles fast, uniform, and reproducible. SNPs showed superior antibacterial activity toward E. coli and B. subtilis pathogens. It is an environmental friendly process for the production of SNPs and completely free from toxic solvents and chemicals. So, it is one of the effective recycling processes to utilize the O. majorana and C. sinensis for the production SNPs. Therefore, biogenic synthesized SNPs can be used for waste water treatment, food and water storage, and manufacturing medicinal supplies such as beds. All authors have been involved in the writing and interpretation of results during preparation of the manuscript. All authors read and approved the final manuscript. The authors are grateful to the Daulat Ram College, University of Delhi for carrying out experimental work. I express my sincere thanks to the director, USIC, University of Delhi, for providing instrumentation technique which is necessary this research work.